I haven't flown for six years. I didn't feel a pressing need to travel, but most of all I didn't want to make such an enormous contribution to climate change. A return flight from Melbourne to London pumps about 1.8 tonnes of carbon pollution into the atmosphere, wiping out other efforts to reduce emissions at home. For a roving freelance journalist, it was a principled but ridiculous stance. I once spent two days on buses between Adelaide, Melbourne and Sydney just to conduct a few face-to-face interviews. My most impractical assignment was researching the Queensland sugar industry — two days on a train, then a taxi into the cane fields around Bundaberg. But now here I am on a Jetstar flight to Sydney for a climate change conference. As the plane takes off, I squirm with a sense of hypocrisy: I've broken my vow for the same reason I made it. Returning to something after a long absence brings fresh insight, so I spend the entire trip pondering why we fly, and why it's so hard to give up. The answers are less obvious than they first appear. There's the convenience, of course. We slingshot ourselves from one place to another in order to get there more quickly. But even that's more complicated than it seems. Once everyone has access to the same conveniences, they congeal into cultural norms. You're expected to fly at a moment's notice for work or a family crisis, and refusing to do so can leave you unemployed or ostracised. This social and cultural pressure is rarely acknowledged. Watching paddocks pass underneath as the plane crosses northern Victoria, I can think of another compelling reason we fly. The status. Flying makes us feel important, as the language we use to talk about it reveals. Cognitive linguist George Lakoff argues that we think in terms of metaphors. By metaphor he doesn't mean rhetorical flourishes that catch our eye because they are unusual or poetic. He means phrases so familiar we don't notice them. "One of the reasons sustainability lacks appeal is it's described as a down concept. We're asked to reduce our emissions or live a low-impact lifestyle ... Refusing to fly takes this heresy to its extreme: here is someone literally renouncing the high-life." His book Metaphors We Live By mentions the orientational metaphor up-down. We use these concepts with remarkable consistency. For example, happy is up and sad is down. So we say 'that boosted my spirits', 'you give me a lift', 'he's feeling low' or 'his spirits sank'. Virtue is up and depravity is down: she has high standards, he is an upstanding citizen, that was a low trick, don't be underhanded, I wouldn't stoop to that. High status is up and low status is down: he has a lofty position, she'll rise to the top, he's at the peak of his career, I've hit rock bottom. In this framework, flying is metaphor made real. When you're in a plane you're elevated, aloft, high above. Those are literal descriptions of your orientation, but also metaphors of your place in the human hierarchy. But hang on, doesn't everyone fly these days? It's not a luxury like it was in the 70s. Yes, it can seem that way if you look at a rich industrialised country such as Australia. But if you look at the whole planet of 7.5 billion people, it's clear that flying is still the preserve of the comparatively wealthy. Globally, high flyers are high status; it's just that many of us would be surprised to find ourselves counted among this elite. Gazing out the window at the horizon, I can see another less obvious appeal of flying: a sense of perspective. Again, it's both literal and metaphorical. From up here we have a bird's eye view, a sense of the bigger picture. We're not bogged down in the detail. It's a place for high-level thinking — and, as Lakoff writes, intellect and rationality are also up concepts in our culture. One of the reasons sustainability lacks appeal is it's described as a down concept. We're asked to reduce our emissions or live a low-impact lifestyle. Intuitively, many people translate this to mean a lower quality of life. This is why the idea of deliberately living with less is so baffling to most people — it sounds like you're choosing poverty, even if that's not what is meant. Refusing to fly takes this heresy to its extreme: here is someone literally renouncing the high-life. There are many rational reasons why, even as climate change bites, we'll keep burning fossil fuels to fly from A to B. Teleconferencing software can never replace the intimacy of a face-to-face meeting. Business people will continue to seal deals in person because it builds trust. Nor can armchair travel or virtual reality surpass the wonder of waking up 24 hours after takeoff in an entirely different culture and climate. So we'll keep transporting our bodies thousands of kilometres for work or play, and most land or sea travel is too slow to meet the demands of people living in such a fast-paced society. 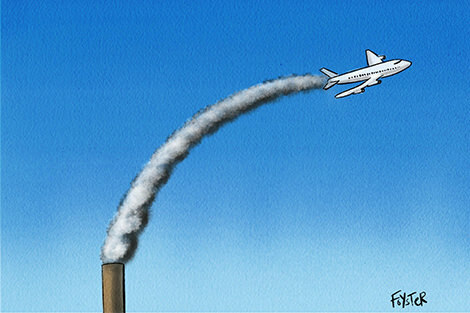 That leaves planes, and there aren't many good alternatives to carbon-based jet fuel. Growing crops to manufacture biofuels is possible, but it takes up arable land needed for farming. While batteries hold promise, they're still too heavy for the amount of energy they provide — a crucial point when you're trying to get a 400-tonne Boeing 747 off the ground. But another reason we'll keep flying is emotional and, dare I say it, philosophical. Flying reminds us that we are members of a species clever enough to break the rules governing other land-locked mammals — those lowly creatures so beneath us! — and exist in a higher realm. Aside from the seductive convenience, it's this metaphor of flying that makes it so hard to resist. Technically it is possible to travel from London all to the way to Singapore and even to Jakarta and Bali without flying using the Trans-Siberian railway. You'd have to travel through about 13 countries, make at least eight changes and it would take you the best part of a month. But I suppose if you have a sense of adventure, a fair bit of money and want to see part of the world most tourists won't it would be a good experience. The closet I've seen to a viable notion of a world without flying is, oddly, conspiracy theorist and climate skeptic Lyndon Larouche's proposal for a "world land bridge," which is to connect all the worlds land masses by high speed rail, including a tunnel under the bearing straight linking Eurasia and North America, an inter-american railway, an Alaska-Canada railway and a new sim road between China and Europe. I think he also proposed using magnetically levitated trains too... As for Australia - Proposals and studies for a high-speed train between Melbourne Sydney and Brisbane have been bouncing around Canberra since the 70s. I'll believe it when I see it. People choose to fly because it delivers them somewhere in an hour that would otherwise take them a day. They consider the cost versus the benefit and purchase the ticket. The airline industry manufacturers are trying to build effiecient aircraft to keep costs low to drive more passengers. This is called passenger economics and all modes of transport operate according to different rules. As we use more renewables, and unlock more gas globally, the price of oil stabilizes or falls and provides cheaper prices to fly. Airline expenses run roughly 1/3 for each of planes, wages, fuel. Qantas is generating profit because of lower fuel prices and relatively high AUD currency.... and because you and 3.5B other passengers benefit annually from the incredible convenience and utility air travel provides. Welcome back to the Sky's Greg. Being a contradictory creature, I dislike flying and yet I fly. There is nothing attractive to me about sitting in a plane high above the landscape, quite the opposite. Yet, I can visit my grandchildren who live some distance away for more time, a very precious thing. I can see places I've only dreamt about. I realise the good fortune I have in being able to do that. Ideally, we would walk everywhere. Greg, stop living with regret.... I live in a developed world where I expect the lights to turn on, heating in winter, some AC in summer and refrigeration for my food. I drive my car and take holidays overseas.... Yes, We are very fortunate, but I don't live with regret for all the benefits a developed society provides. I have lived in Indonesia and traveled extensively in poorer countries and I have experienced poverty of other nations. When I fly, which is rarely, I pay to off-set my emissions! This money is used to plant native trees that not only soak up carbon but also provide habitats for native birds and other animals. I suggest others do the same. Greg, Very thought provoking. I have travelled across the globe quite a few times in my working life , even more often to Sydney or Melbourne on work related trips. Recently prior to my retirement, my Department tried a cost cutting exercise by tele conference. We decided it was not as effective as face to face! I sense your guilt! A great piece, Greg, I enjoyed it very much. Its smooth, easy reflection was more like gliding than plane travel but it was definitely an up piece - it gave me a lift. I was taken by the comment ".. sustainability lacks appeal is it's described as a down concept. .... it sounds like you are choosing poverty". I wonder if this suggests why so much aid (especially in rural areas) has failed over the years. Julia, it's the Bering Strait. Thanks all for the feedback and kind comments. Lovely words Antonina, Gavin and Joe! I hadn't heard of the "world land bridge" before so thanks for telling us all about it, Julia. Like you I'm also skeptical about whether a high-speed rail will happen in Australia. It's the stuff of satire these days - see that Utopia episode? I don't live with regret, but there's a bit of 'privilege guilt', which is a good thing. While there is real poverty in Australia, on average we are well off compared with people in many other countries, and it's worth remembering that and being thankful - not taking it for granted. I count flying among those privileges. Greg, congrats on thinking about the impacts of your actions. Very accurate observations abut how people react if you choose to live a low impact life. Most don't like the status quo being challenged. As such a clever species it is amazing the lack of foresight we have in regards to how we are damaging all the free services nature provides us. Have you heard of ecological foot -printing?? Technology is indeed a two-edged sword. It has transformed the earth, overwhelmingly for good, and yet it is a threat by increasing our carbon footprint. And it is/will be technology that will sort this out, in all sorts of ways, some known and some currently being imagined. Passenger Airplanes of the future, for example will have much much cleaner engines; cars will be electric etc. But what we cannot do is over-reach and overreact: as Australia has done over (clean) coal and gas exploration and extraction, for example; which overall will reduce rather the increase emissions. The greatest danger to civilisation is the ideological green-left, which seems to have grossly disproportionate influence; disproportionate to its ideas and strength of arguments, not to say its small numbers (outside of the ABC,the "media" and the Twittisphere). Thanks Greg. I am interested in why you chose to fly again? For the reasons in this article?